Dr. Don Galbo was born and raised in Darien, Connecticut. He moved to Newnan over 30 years ago when it was in its infancy. Though our community has grown, we still enjoy the small-town feel with plantation-style homes and a beautiful downtown square. Our family practice offers excellent dental care to all ages, from children to adults. We strive to provide the most progressive dental care available, using the latest in materials and techniques from all over the world. 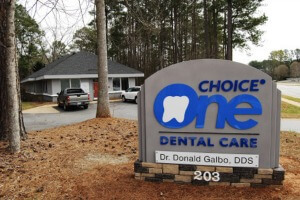 Choice One Dental Care of Newnan offers you a warm, comforting environment with a friendly team who’s ready to put you at ease from the moment you walk through our doors. When you choose Choice One Dental Care of Newnan, you’ll get the benefit of Dr. Galbo’s many years of experience. We want your dental care not just to be of the highest quality, but to be affordable and tailored to achieving your oral health goals. You’re our priority, and we strive to exceed expectations at each of your visits with us. Insurance coverage is accepted, and we are happy to verify your coverage for you prior to your appointment. Dr. Galbo is an in-network provider with Aetna® and Guardian®. We also offer a range of payment plans to make sure that high-quality dentistry is accessible to all. Book your time with our helpful, knowledgeable team today!